The American conservative punditry class professes itself shocked -- SHOCKED!-- to have heard Karl Rove trashing the newly-elected Katie-Couric-perky Republican nominee for the coming Delaware Senate race, Christine O'Donnell. He let rip with his bash-fest on Sean Hannity's FOX News program, talking of the "nutty" things she has done, and casting a piercing eye on her college loan history -- basically dismissing her as a person and pronouncing her next election already lost (apparently his failed prediction of a Castle victory not giving him any pause). The reaction was swift and sweeping: King of all Media Rush Limbaugh himself, a huge Rove admirer, was non-plussed at Rove's barrage of poisonous little darts ("little" being the operative word: the remarks were nasty and cutting, and the targets were spectacularly off-centre). Suddenly the wide conservative /Republican world was questioning the perception, loyalty, and ultimately the usefulness of the man dubbed "The Architect" for his engineering of George W. Bush's political victories. Some of us have been questioning everything about Rove's reputation as a political genius, for a very long time. I think I pretty well nailed it here -- five years ago, you'll notice. Get with the program, world. 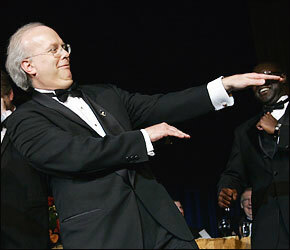 Time for Mr. Rove to be shufflin' on down the road. All this is not to say that Ms. O'Donnell is necessarily some kind of prize as a candidate -- she may yet prove to be an underperformer extraordinaire. But the idea that opting for the proven RINO would have been preferable, and the implication that the voters are too stupid to know what's good for them or to exercise their judgment and roll the dice on a new direction, are offensive beyond words -- a sign from all quarters of the political class that they are tone-deaf to the times, and will soon find themselves paddling around in the wake of a political tide that has passed them right by. Mr. Rove has proved himself tiresome, in addition to being no genius. I suspect we will see less and less of him as the season goes on. 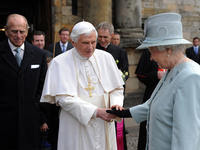 His Holiness Pope Benedict makes the first official state visit of a Pope to Great Britain in 500 years. Mass in Scotland opens with a welcome paying tribute to St. Thomas More and various martyrs of the Reformation. Ooh-rah. Posted by Winefred at 10:26 p.m.